Disney (NYSE: DIS) had a mixed first half of the calendar year, despite solid gains in core segments – as both earnings per share and revenues came ahead of market expectations in the March quarter but missed in the June quarter. The company’s revenue increased 8% year-over-year (y-o-y) to $29.8 billion and operating income grew 5% y-o-y to $8.4 billion. In addition, the company’s profits rose nearly 30% y-o-y. We have summarized our forecasts for Disney’s fundamental value based on expected 2018 results in an interactive model. You can modify assumptions such as changes in expected segment revenue or EBITDA margins to see how they impact the company’s value. 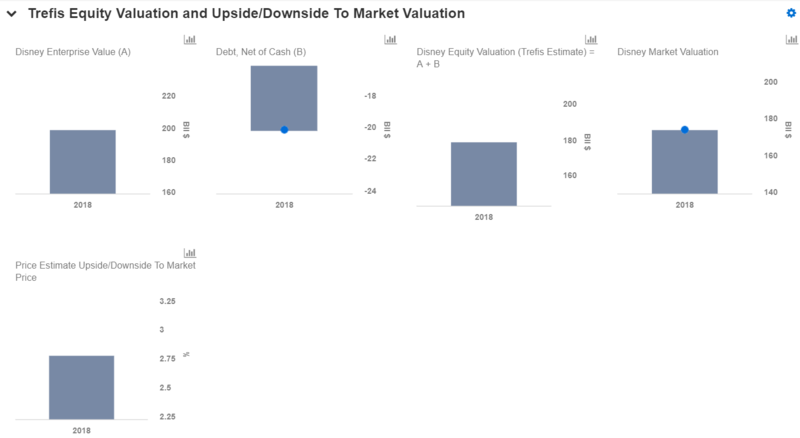 The charts below show some of the key steps in identifying Disney’s valuation sensitivity to changes in its segment revenues. We detail how changes in revenue or segment EBITDA margin impacts total EBITDA, which then impacts its enterprise value (assuming a constant EBITDA multiple). We expect Disney to generate around $58 billion in revenues in the calendar year 2018 (the company’s fiscal year ends in September), and earnings of almost $10 billion. Our revenue forecast represents a year-on-year growth of around 4%. 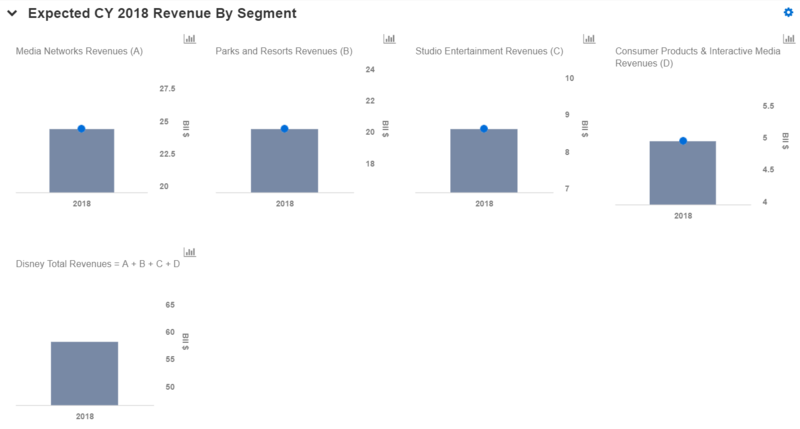 Of the total expected revenues in 2018, we estimate $24 billion in the Media Networks business, almost $20 billion for the Parks and Resorts business, nearly $9 billion for the Studio business, and close to $5 billion in the Consumer Products and Interactive Media segment. Disney’s stock price has increased slightly over the course of 2018, primarily due to the focus on the company’s new online streaming media service and the acquisition of assets from Fox. Our $120 price estimate for Disney’s stock is slightly ahead of the current market price. Looking ahead in 2018, we expect Disney’s studio business to benefit from the release of Ant-Man and the Wasp and Incredibles 2 in the upcoming quarter. The studios have already benefited from the release of Avengers: Infinity War during the recent quarter, which collected more than $2 billion at the global box office. In addition, Ant-Man and the Wasp has already collected more than $200 million at the domestic box office, which is more than the entire studio collection for Q4 last year. Disney continues to make enhancements to its parks with the recent opening of the new Toy Story Land at the Shanghai Disneyland. Overall, we expect Disney’s theme parks to be an important driver for its long-term growth due to its international expansion. At Media Networks, the segment continues to be driven by growth in affiliate revenues, offset by a decrease in advertising revenues. Our forecasts for the year are summarized in our dashboards for Disney. If you have a different view, you can modify various inputs to see how updated inputs impact the company’s valuation. You can also share the links to scenarios created on our platform.